I'm Hungry. Hungry life a wolf! 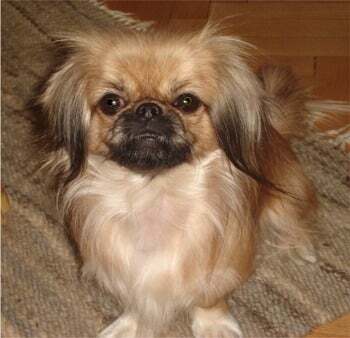 Pekingese are a small breed of dog. One of many breeds I refer to as "yippie dogs". Because all they do is run around emitting loud 'yip yip yip's. I also call them annoying little rat-dogs. But, some people like smaller dogs. My sister likes small dogs. I prefer my dogs a little bigger. In fact, I like dogs that look like ancient doggy ancestors. Ancient doggy ancestors? Haven't dogs always been dogs? No. Way back when, in the long long ago, when man was still a hunter gatherer, there were no dogs. There were Wolves. Wolves and man had a very tenuous coexistence. Man left the wolf alone, and the wolf tried to eat the man. Seems fair. But, at some point in the past, no one knows for sure exactly when, Something happened. One night, while man was eating around the fire, they noticed the usual scavengers weren't around. Usually there were rats, mice and other assorted vermin infesting the camp. But tonight was different. There weren't any around. Maybe, the men thought, it was because the wolves lurking around the edge of the fire light were keeping them away. One of the men decided to reward the wolves, so he tossed out some food. To make a long story short, before long the men learned that if they tossed out meat for the wolves, they would not attack, and keep the assorted pests away, and the wolves realized they got free food for hanging out. Over time, man and wolf became friends, and started living in close proximity. The wolves lost some of their wildness, and were specially bred to bring out certain traits, like exceptional smell, or rat catching ability, or retrieving abilities. Soon, we had dogs, not wolves. They were related, but different animals. Today, you can look at certain dogs and see the traces of wolf in them. Like the dog that is closest genetically to the wolf: The Pekingese. That's right. The dog that has the most in common with a wolf is a small lap dog that yips like there's no tomorrow, and pee's when you scare it. Maybe Twilight should have been Vampires vs Were-Pekingese.